In summer 2014 we put a big solar energy plant on four of our roofs. On sunny days the photovoltaic cells produce enough energy to power or whole company! The next step is already in the making: a storage battery to make sure we can save or self-made power for the darker hours in the early morning during the winter. Furthermore our solar plant delivers the power for our completely electric delivery-van. 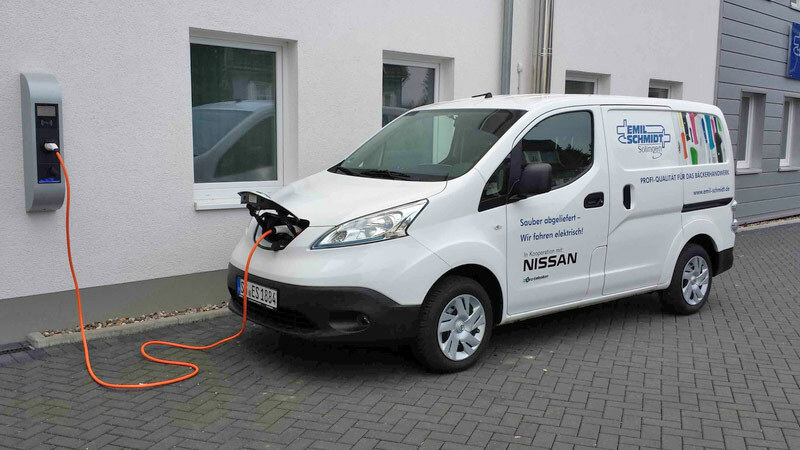 Since November 2014 we have a Nissan eNV200 for deliveries, errands and other short ways in the inner city. The van is able to carry two europallets and a payload of 650 kilo, enough for even large deliveries! Many people criticize the short range of approx. 150 kilometers of these electric vehicles – but for our purpose this is completely enough. This way we can move emission-free and soundless in the inner city and are independent of fossil fuels and gas prices. We believe that e-mobility is an essential step into an ecologically beneficial future and a sustainable company policy. For this reason we replaced two cars with traditional combustion engines by two plug-in-hybrids. Fully charged, we can drive our VW Golf GTE and Passat GTE 50 kilometers electrically. And if we need to go on a longer business trip, they take us to our destination in hybrid mode. Our aim is to drive completely electric with all our cars until 2020. We are convinced that the future will belong to e-mobility and that we have no chance than to bow out of fossil fuels. And to be honest – everyone, who had the chance to drive and experience an electric car, knows how much fun this form of sustainability is!